This villa, known in the eighteenth century as Villa Alamandina, was the country residence of King James III and VIII outside Bologna. 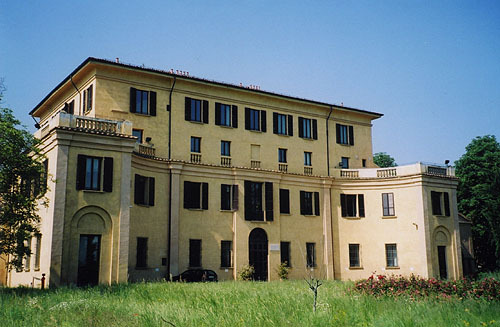 1 James, his wife Clementina, and their sons Charles and Henry often stayed in the villa in the 1720's when it was owned by the Alamandini family (and, after 1729, by their heirs the Bolognetti family). The villa is located at Via Tommasso Martelli, 22/24. Today it houses various departments of the Università di Bologna, including the Alma Mater Foundation, the Institute of Advanced Studies, the School of Journalism, and the Interdepartmental Centre for Studies on Islam. 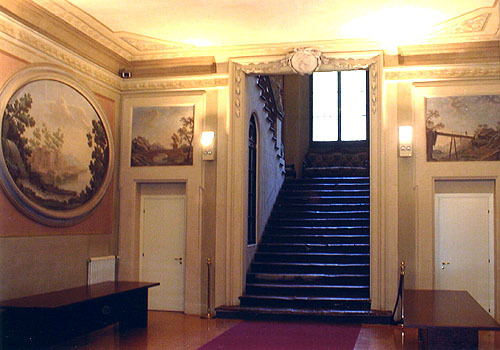 The villa can be reached by leaving Bologna through Porta San Vitale and continuing along Via Giuseppe Massarenti. Via Tommasso Martelli is about four kilometres east of the city walls, about a kilometre past the A14 highway.2 The villa is surrounded by a high wire fence. In order to obtain entrance it is necessary to use an intercom system at the gate (which is very poorly marked). The villa is made up of a four storey central block from which small two storeyed wings curve out at each corner. 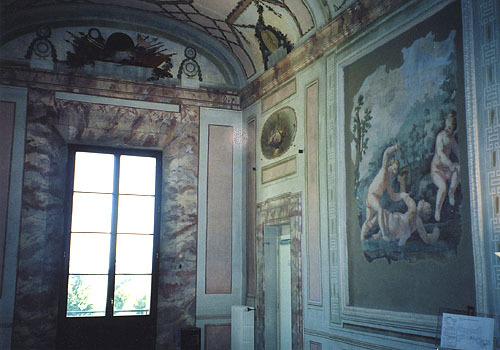 The ground floor entrance hall is decorated with lovely frescoed landscapes. 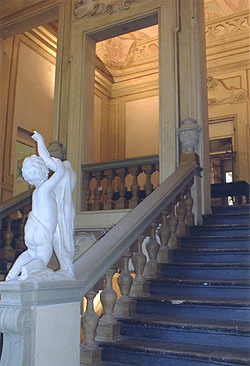 A grand staircase leads to the first floor which is decorated with fresoes of putti playing. The villa is surrounded by a park which is not presently well maintained. Next to the villa is a small chapel. 1 Alice Shield, Henry Stuart, Cardinal of York, and His Times (London: Longmans, Green, 1908), 149; Martin Haile, James Francis Edward: The Old Chevalier (London: J.M. Dent, 1907), 327. This Villa Pallavicini should not be confused with another one of the same name to the west of Bologna in Borgo Panigale. 2 The villa can be reached by taking bus no. 14A from Piazza Maggiore to the stop named "Martelli". The stops of the no. 14A bus going east from Piazza Maggiore are as follows: Ugo Bassi, Rizzoli, Strada Maggiore, Torleone, Porta Mazzini, Porta San Vitale, Pronto Soccorso, Ospedale Santa Orsola, Massarenti, Stazione Rimesse, Parco, Sottovia Massarenti, Grattacielo, Tangenziale San Vitale, Antolini, Barelli, Martelli. Image 2 (Ground floor): © Noel S. McFerran 2004. 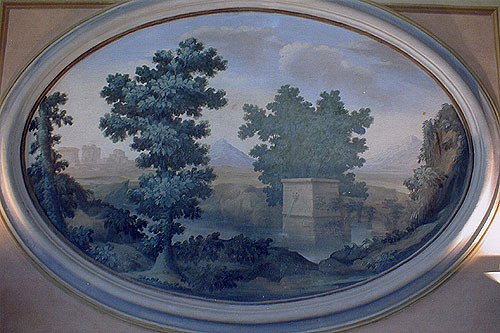 Image 3 (Ground floor fresco): © Noel S. McFerran 2004. Image 4 (Staircase): © Noel S. McFerran 2004. Image 5 (First floor): © Noel S. McFerran 2004. This page is maintained by Noel S. McFerran (noel.mcferran@rogers.com) and was last updated January 20, 2006.